Things aren’t necessarily getting much better for Scott, but they most certainly are changing. The man continues to lose a little mass with each passing moment, and he’s still living in fear of a massive black widow that has designs on turning him into an appetizer, but in issue three things take on a different tone. For the first time in a long time something right is happening in Scott’s life: He’s got a romantic interest who, interestingly enough, also happens to qualify as a genuine “little person.” Scott meets this little lady at a local carnival, and for a brief time enjoys a little romance with someone he can relate to. It’s not easy on his wife, but she’s able to understand the situation for what it is; what it is is out of her control, entirely. We also learn a bit about the potential trigger to Scott’s shrinking episode, which could all be a delayed side effect of an incident he experienced with an insecticide some time back. This is something we’re destined to explore further, but for now scribe Ted Adams does a great job of introducing the answer to the story’s greatest mystery. Time is winding down for Scott Carey. He has days left to live, but his story is only becoming more thought-provoking with each passing issue. 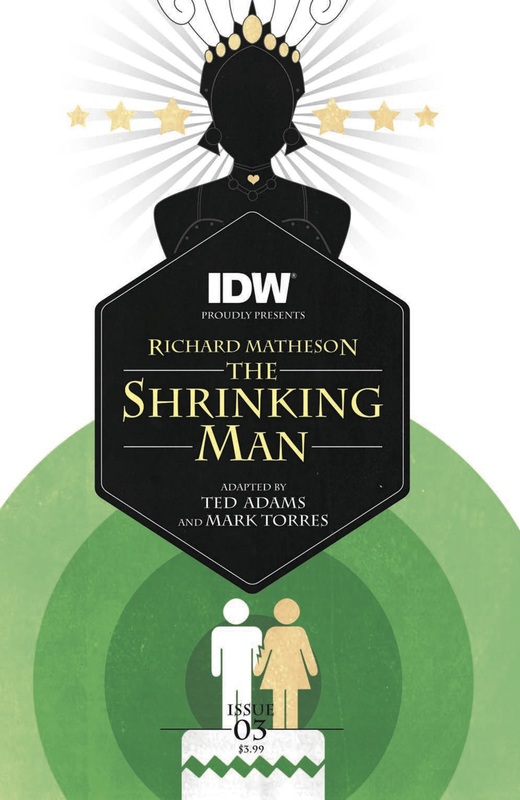 Adams has done a superb job of adapting this Richard Matheson story and Mark Torres’ artwork still feels extremely fresh and very fitting to the tale. IDW has a lot of excellent books on the market, but this is clearly one of their true standouts in 2015.